It only took us about 25 minutes to travel out to the Great Barrier Reef from Cape Tribulation. After the necessary safety talks, we set off. The colour exploded around us. A number of the shots I took ended up in the recycle bin because there were schools of out of focus fish in the way! It was that kind of place. When you were over the coral you never knew where to look, and it did not make that much difference anyway – there was always something to see. I’ve never been in a place where I could name so little of what I saw. Normally I would have found this annoying, but here there was no option but to give in to the wonder over abundance. I’ve picked these images to try to give an idea of what drifting about on the surface of this reef was like. They may not be pin sharp, but then again neither are my memories. Colour and movement, shape and form, schools of half hidden fish, specks of life with colour to spare, more after more after more. I loved it. I’m going back. I expected that the Great Barrier Reef would be bright, but I have to say I was pretty shocked when more or less the first thing I saw was a bright blue star fish. And as you can see it’s not blue in a pale washed out sort of way, it (they!) were bluer than cheap jeans. The common name of this star fish is The Blue Starfish (!) and its scientific name is Linckia laevigat. In the end we saw quite a few of these wonderful animals. They are not much bigger across than an adults hand, but they are smaller than the smiles they create in kids! This is the first of my special “reef week” posts – more to come. 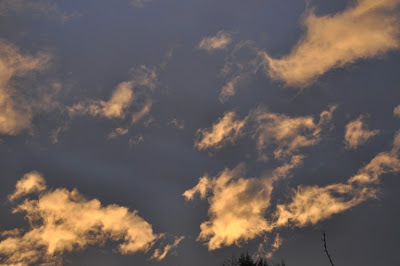 These pictures were taken less than an hour after last Fridays Skywatch pictures. Just to make sure that I did not get too carried away, the weather decided to replace rain with a mist! All the times you hear that the “river/lake/sea was like a mirror” can make you forget that sometimes it really is! So this is sky river post. I don’t really know what was causing the green mist to the right of the tree – but it was there when I took the picture - strange! 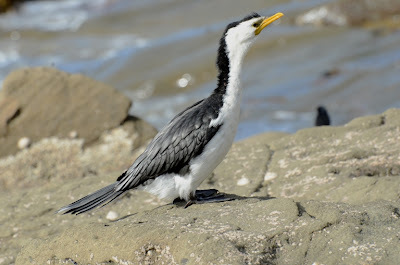 You can find the first “wordy” post about my trip to the Daintree here – if you like some of my pictures you can find more there along with some of my words. Southern Cassowary are an iconic, flightless birds found in a relatively small area of Northern Queensland (plus PNG). They grow to just under 2m tall and a large female would be pushing 60 kg. These are, by any measure, an impressive bird. We were walking along a board walk through some reasonably dense forest when we happened upon this female and a well grown chick. We were just in the right place at the right time. With a bird this think on the ground there is always an element of luck involved. Although generally considered shy, there was no evidence of shyness in these birds. By the time they melted back into the forest, a group of about eight people we watching them. At one stage I had to move away from the adult bird – not because I was feeling any form of threat, but because it was too close to focus on! These are I need to say, wild birds! You can see the free hanging wattles that hang from the neck and the large crown or “casque” on its head. This casque grows as the bird matures, and you can see the base of it on the head of the young bird. As you may well imagine I got rather excited about these birds. We also another adult and chick cross the road in front of us later in the trip – remarkably they were crossing near a road sign of the “look out cassowary crossing” type – what a strange coincidence. You can find more wild birds – although possibly not ones this big! – by clicking on the links below. The Great Barrier Reef is such an icon that it may even suffer from its own reputation. We had booked in on one of the large reef tours that depart from Port Douglas, but weather, a sense that we really did not want to snorkel with 250 other people and the discovery of a small company based at Cape Tribulation made as cancel. It was a very good call! The reef was remarkable (pictures will follow) but the trip also happened to coincide with the return of the Humpback Whales to the area. They had been seen briefly the day before, but on our trip they put on a bit of a show. There were at least two whales in the area. They seemed to be staying at the surface, slapping the water with their tails rather than diving. We could not get too close to the whales, but the whole thing was pretty exciting for all of us. I had hoped to see good things on the reef (and I did), but the whales were a bonus. And just like the small stone you put in your pocket as a memory of a beautiful beach, the few minutes we watched these remarkable animals will be a powerful memory. I’m not entirely sure these count as genuine macro shots – but these are as close up as I was happy to be if the truth be told! These are Estuarine or Salt Water Crocodiles. Although these are not huge there are large enough to discourage swimming. 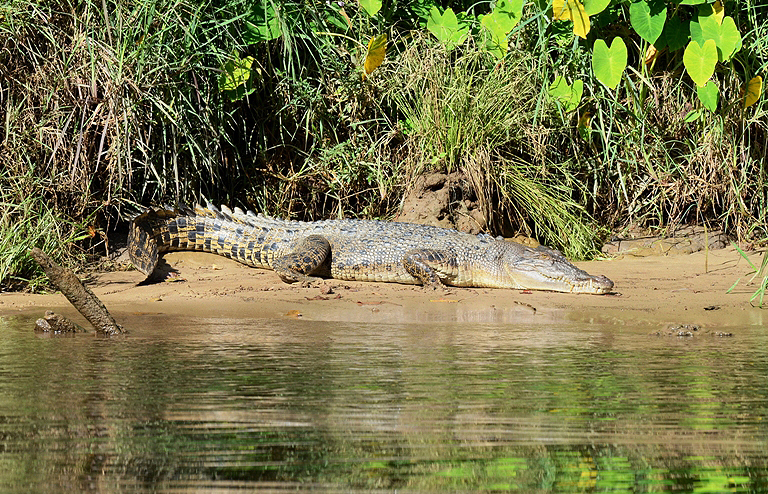 The Daintree River is famous for its crocodiles and we found these at the start and end of the day – just waiting for a chance I suppose. In the pictures of the adults you can see the large tooth the sticks up on the outside of the mouth. This is used to separate crocodiles from alligators. In alligators this tooth fits into a pocket in the upper jaw rather than being visible on the outside. I think it would be important to tell the difference between a croc and a gator when one is attached to your leg. And the mystic arts of taxonomy provide you with an easy guide! 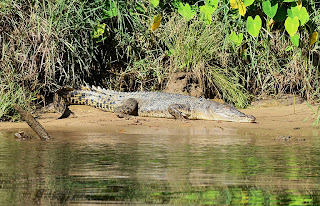 The young crocodiles were still hanging around the nest site – but were very well hidden. I think the buzz you get from seeing a predator of this size in the wild is all the justification you need to protect them. A world without them would be a much lesser place. Finally managing to get some images from our week away in the Daintree sorted out. Basically it rained for most of the time – but that’s why humans invented waterproof jackets and weatherproofed cameras! On one day – when I happened to be up early for a morning birding trip – the sky was almost clear and it looked like the sun would shine. I drove away from our accommodation in the darkness and travelled as the sun came up. It was a great morning. These are the best shots I got – I was just so pleased it had stopped raining! Some of you may know that I have just returned from a trip to the Daintree Rainforests. One of the (many) highlights of this holiday was an evening trip along the Daintree River. At the day’s end we drifted along small channels and weaving our way along the wider river. There was the kind of stillness that only comes after heavy rain. At the end of one channel, formed between an island and the bank we found a small group of Rainbow Bee-eaters. 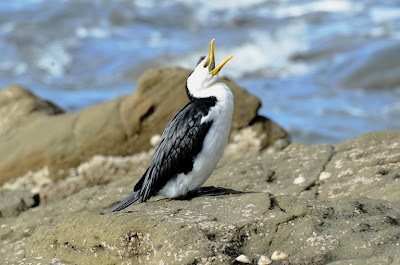 The very name alone tells you that this is a bird well worth seeing. Two or three of these birds hawked for flies (not bees!) from the branches of a dead tree as we tried to get closer. After a day of rain, it only seemed appropriate that we found rainbows. So no I welcome you to join in the first Wild Bird Wednesday – my thoughts about this meme can be found by clicking the tab at the top of the page. 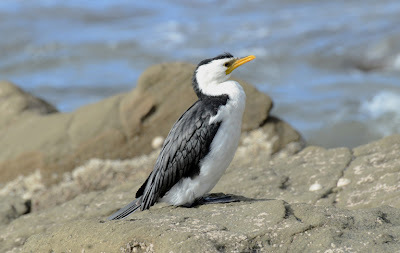 So, now I invite you to use the link tool below to start building a group of Wild Bird Photographers. I’ve just come back from a rather wonderful and wet trip to North Queensland. 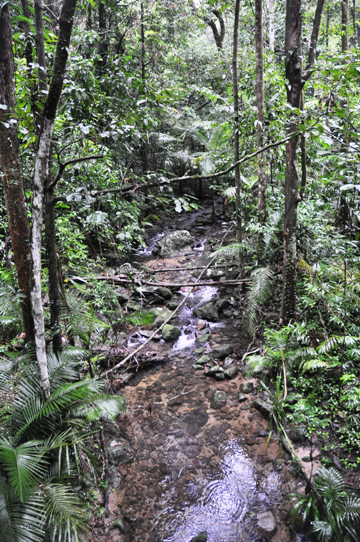 The main aim was to visit parts of the Daintree Forest (the oldest rainforest in the world) and the Great Barrier Reef. 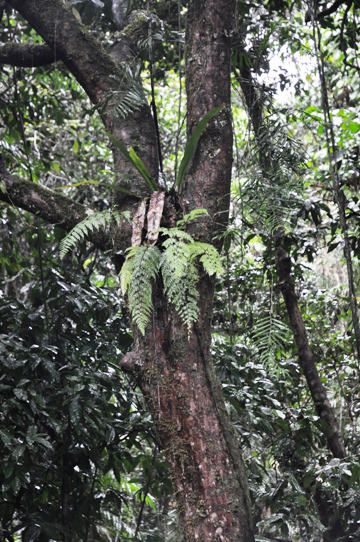 I don’t suppose you can have a rain forest without rain – but the weather was stretching the friendship a bit at times. The picture of the river shows a place that it often used as a swimming hole! So you can see that it was a little damper than expected! I spent a week using much slower shutter speeds than I often wanted to! But the experience of the place was still wonderful – so many shades of green. I think the rain kept much of the wildlife, hunkered down for protection – but we did get so see some good stuff. So, here to start a run of post on the Daintree are a few shots taken on the Mossman Gorge. Green, wet and rather wonderful. This rather impressive beast is a female Golden Orb Spinning Spider. You can tell is a female because it’s huge! The bodies of the males are only 6mm long but the females are much larger, with bodies up to 50mm long and leg-spans reaching 200mm or more. I have been told it’s the largest web spinning spider in the world. They have been seen to catch small birds and slight larger snakes! 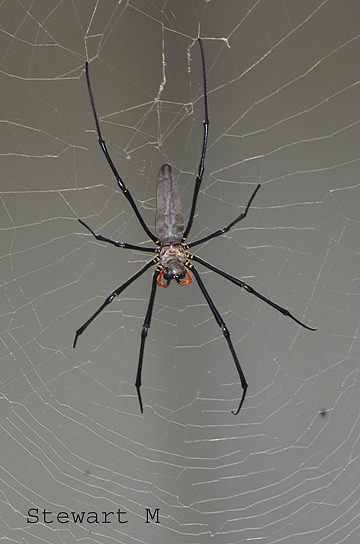 The silk they use to weave their webs often has a yellow colour - much like dried pasta - hence their common name. I found this young lady in the Daintree Rainforest, north of Cairns in Queensland. As you can imagine not everybody who walked by as I was taking this picture was pleased to see her! Hi there - I've been away for a week. Normal service will resume with about 24 hours! Will be reading and replying asap! There have only been a few hours of blue sky over the last week – and while I was tempted to post a sombre grey sky, I decided to go for colour instead. 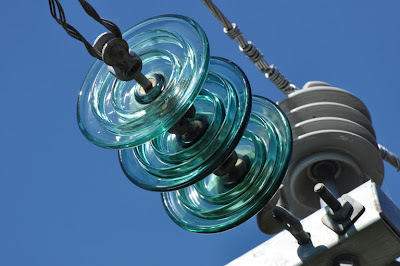 These wonderful glass objects are the insulators on the electricity pole outside my house. I often notice them catching the sunlight and on this occasion I was really pleased with the range of colour I caught in them. 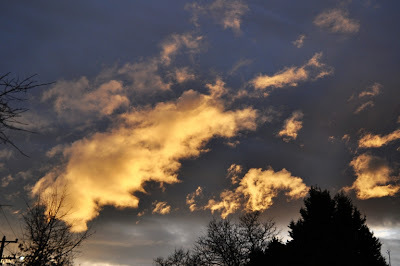 It may not be a picture postcard sky, but it is part of the one I see every day. This striking bird is a Pied Butcher Bird. Not only are they very good locking, they have a wonderful mellow voice. These pictures were taken outside a friend of mines house in Brisbane. I was called outside by this bird’s voice. As you can see I was not the only one who noticed that it was about. The Noisy Miners in the background mobbed it until it flew off into another garden. At that time I heard a commotion start in that garden as well. I can only assume it’s not a very peaceful life being a Pied Butcher Bird! I’m lucky enough not to have to do anything really resembling a commute to work. I can drive, or catch the train or even walk if I want. I tend to vary it day by day. And although there can be occasional frustrations, I actually like public transport – it’s a physical embodiment of the kind of things I think communities and governments should provide. 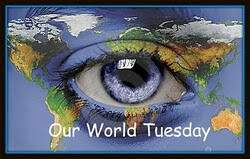 It’s a shared experience in a world that tends to keep us apart. I tried to capture both the speed and the slowness of train travel in these shots – the process of “hurry up and wait” that can come on in the mad hour when we all try to get home. These pictures were taken a while ago, but I just re-found them when I was sorting out some files. This is the kind of shot I don’t take. So, it’s a surprise to find myself (a) taking it and (b) posting it! 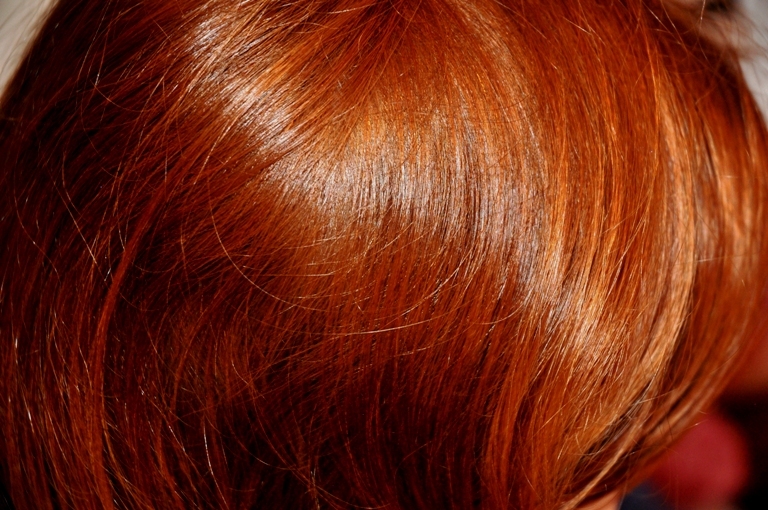 I live in a house surrounded by the slightly rare but ever so special kind of person – the red head! I live with three of them in fact! This is a close up of P’s hair. There are times when I am amazed by the colour of it. You can find more macro shots, most of which will have less of the overt tang of parental pride associated with them (! 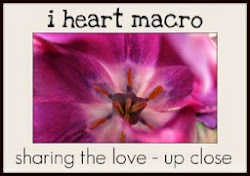 ), here at Macro Monday. Sometimes you miss something and find something else. 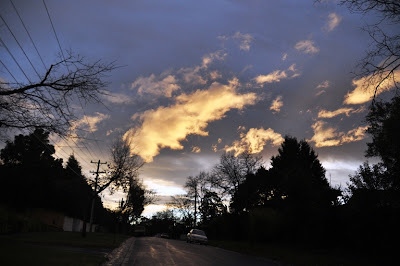 A few days ago I dashed outside to try to capture a rainbow that had formed behind our house. As I was getting into a position where I could get a decent composition I could see it fading – it’s a rather sad thing to watch a rainbow die! I turned round to walk back home and found I was looking into this sky. I rather feel this made up for my lost rainbow. Or, to look it another way, this was the pot of gold at the rainbows end! Hi there – bit of a brief post today. This is a Little Pied Cormorant – it was showing rather nicely on the rocks at Lorne during our trip away. Rain, work, a sore back and trips to the circus has rather cut down my birding time over the last few weeks, so I’ll post these rather than something a little more current. You can see that there is a Willie Wagtail trying to get in on the act in the background of the pictures. Clearly he does not know about the limitations of depth of field and telephoto lenses! You can find the latest post to my other blog by clicking the Paying Ready Attention image on the RHS of the screen. 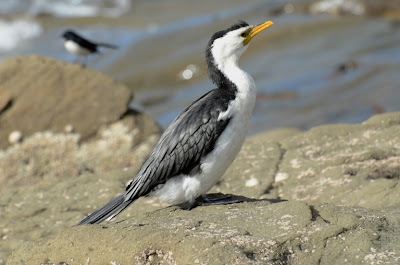 These birds also show up in that blog - so if you want to read more about what I had to say about them, click here. It really is winter here. Cold and wet. We are not talking deep snow and wolves at the door, but I actually worn a hat today! What better way to spend a winter’s afternoon than a trip to the circus. Circus Oz is a circus with no animals - well that’s not really true, all the performers are animals, but one can take pedantry too far! It just has really talented people. Think Cirque du Soleil but without the self conscious seriousness and associated money making machine. We sat in the semi darkness of the big top and had a great time. Wonderful performances and hot donuts! No flash photograph was allowed – but I sneaked a few flash free shots with my compact. The whole event was about movement and light – and this picture seems to sum this up. It’s not sharp, but it does have the feel of the whole event to it. As a side issue, outside the tent are a set of bells on tall towers – the Federation Bells. As we were waiting to go into the big top they were playing. Some of the compositions were great – other were (as H put it) “all a bit random!” You can have a better look at the bells here – and you can play them on the web site to see if you can compose something a little less random! These strange looking things are Earth Stars – they are the fruiting body of a type of mushroom. You can clearly see why they have gained their common name. When they first appear they look like puff-balls, but then the outer “skin” splits and folds back to make the star shape. The central mass contains the spores, and these escape through the central hole as the wind blows – or more dramatically when rain drops crash into it. So, all in all they are a little more interesting than the mushrooms we slice and put on pizza!